As of September, 2015, sources inform me that we should expect the NTSB final report on Zubair Khan's fatal accident (N79ZR) which occurred in July, 2014 within a couple of months - it's awaiting approvals from upper management. In the meantime, through these sources that will remain unnamed, I have come into possession of a rough radar track summary of this flight, with altitude and timing information. 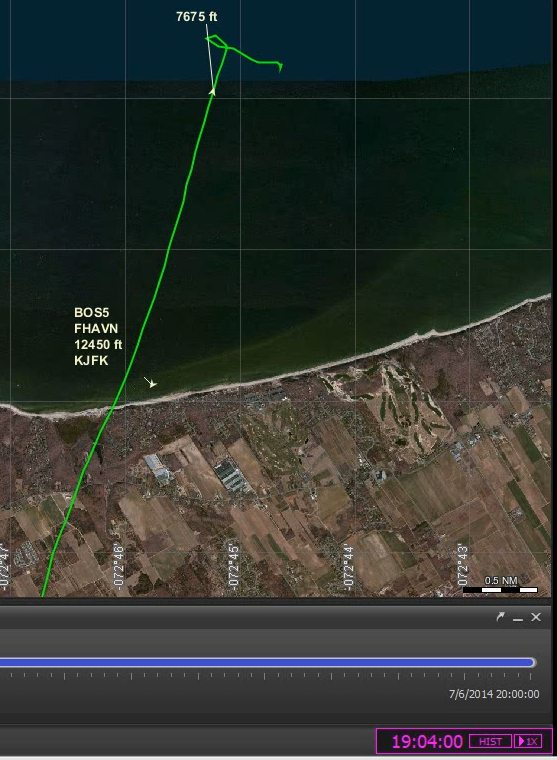 Showing the portion of the flight over Long Island Sound, north of the shoreline. The left vertical scale indicates altitude and vertical speed. 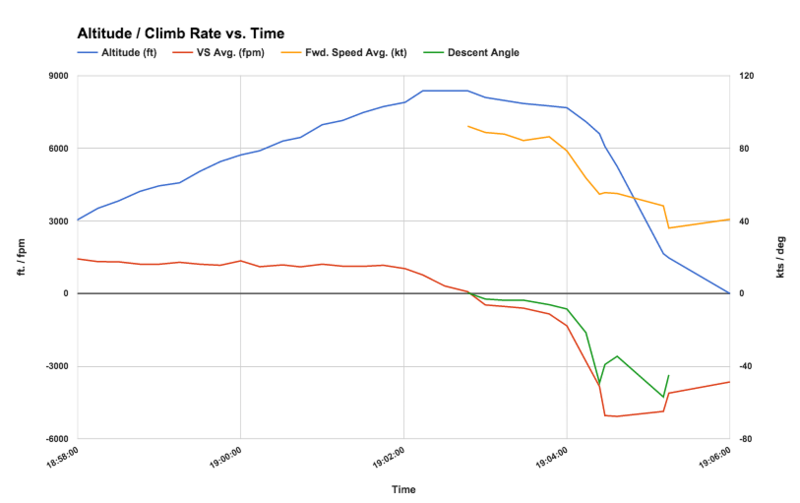 The right vertical scale indicates forward velocity (starting at 19:02:47) and descent angle. The raw data is rough - taken from the radar track with a scale, with jumpy altitudes and positions. The speeds are GS, not TAS or IS (since they're from radar), but even with +/- 5 to 10 kts error, the indications do not change. With a bit of smoothing, the basic picture is clear - the #'s are right to within 10% - 15% or so. 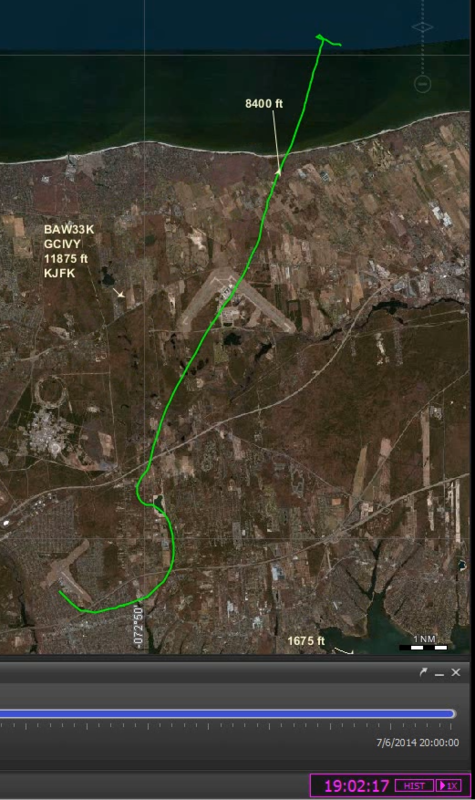 Mr. Khan performed a steady climb up to approximately 8400 ft., while heading north-northeast over Long Island and out over Long Island sound, just north of the Calverton airport. Once over the water, he slowed the airplane to approximately 90 kts. Soon after the aircraft began a steep left turn of 270 degrees along with a high vertical rate descent, which very soon became a descending straight line flight. The average descent rate during the turn and straight flight was about 5K fpm with an average forward velocity of about 50 kts. This gives a descent angle of approximately 45 degrees degrees, with a total velocity of approximately 70 Kts. Soon after loss of radar coverage, the aircraft impacted the water. While a higher descent rate than that calculated/measured by RAF for a Long-EZ (approximately 3500 - 4K fpm), the relatively slow horizontal speed along with the high descent rate and large descent angle clearly indicates a deep stall condition, particularly given the 3/4 mile long straight flight. The flight profile shown by the radar track cannot be supported in any other flight regime other than a deep stall - a 45 degree descent rate in normal flight would very quickly build to extremely high speeds - speeds which did not develop here and in fact, may have decreased a bit over time. Mr. Khan was probably killed or incapacitated by canopy impact fairly early on in this timeline, probably just before or soon after the tight turn and deep stall developed, as he attempted to egress the aircraft by ejecting the forward hinged canopy. This implies that the straight portion of the flight occurred (in a non-spiral stable aircraft) without ANY pilot input - another indication of a very stable deep stall condition. As of April, 2014, Mr. Khan had not installed the leading edge vortilons on his aircraft (I had told him at that time not to perform stall testing prior to installing the vortilons). From other pilots at Mr. Khan's home airport, we know that he had not installed them as of the date of the flight. COZY aircraft N79ZR had been stretched 8" between the canard and main wing by the original builder (not Mr. Khan) and had only a rough estimate for CG range recommendation (I was assisting Mr. Khan with this task and was having extreme difficulty getting accurate information from him, as well as getting him to understand all the issues). It also had a substantially stretched nose forward of the canard, which, with the extra width of the COZY aircraft over the Long-EZ aircraft, was especially problematic at high AOA's with respect to deep stall (and stability, but that wasn't the problem here). This aircraft had two sets of fuel tanks - standard strake tanks about 6" aft of the theoretical CG range (due to the forward move of the CG range from the stretch) and a smaller fuselage tank approximately 20" - 25" FORWARD of the theoretical CG range. Managing CG position in this aircraft would involve a large pilot workload and the calculations of both theoretical CG range and actual CG position were not well formed. With a forward tank so far from the acceptable CG range, burning fuel from the forward tank would move the CG aft very quickly. We do not know from where fuel for the flight was drawn, but we know that Mr. Khan (from airport records) had either topped off the tanks or come close to doing so before the flight. As aft CG and lack of vortilons are two large contributors to deep stall susceptibility (and have factored into at least one previous COZY deep stall incident, in 1996), Mr. Khan's decisions not to install the required vortilons and to stall test an airplane in which the CG range (and CG position) was poorly understood and controlled were not good ones. Install all required aerodynamic safety items, including the vortilons, lower winglets, etc. I liked Zubair - Deanie and I had dinner with him in April, 2014, after I examined his aircraft and spent the afternoon with him. He was bright, engaging, interesting and kind. He was dogged, and extremely hard working. None of that mattered - everyone who dealt with him and attempted to help him modify and fly his aircraft safely believed this outcome, if not pre-ordained, was at least extremely probable, given the way he approached the process. He seemed incapable of actually listening to what knowledgeable people were telling him over the course of the approximately two years since he purchased the project and worked toward flying it. Just very sad - moreso for his family and those that loved him.